The holiday season in Northern Michigan lasts through the month of December and is filled with special celebrations, merchant open houses, visits with Santa, performances by madrigal singers, and of course, snow! Alanson The community open house is Friday, December 7, 5-8 pm. Boyne City begins the holiday season with a parade and open house on Friday, November 23, 6-9pm. Petoskey's Holiday Open House takes place Friday, December 7, 6-9 pm. Decorated shops, special gift shopping treasures, music, chestnuts roasting on an open fire, Christmas tree lighting, street entertainment--this is a holiday tradition. The Charlevoix Merchant Open House is December 1, 10am-6pm. Great deals, and sweet treats provided by the Charlevoix downtown merchants. 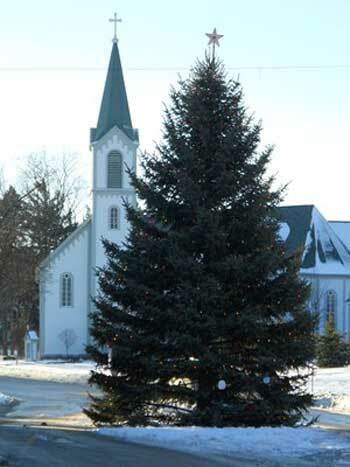 The Harbor Springs community begins the holiday season with the Tree Lighting November 24. The Merchant's Holiday Open House is Saturday, December 1, 6-9 pm. Music, a visit from Santa, decorated shops, and more are on tap for this holiday tradition. Mackinaw City celebrates December 1 with Christmas in Mackinaw with a day long celebration complete with sleigh rides, visit from Santa, crafts, shopping, dining and more. Indian River's Open House is Saturday, November 24, 6-9pm. Walloon Lake Friday, November 23, 6pm, is the tree lighting along with hot chocolate in the Christmas Village.